How do you do binge reading without a proper eBook reader? You just don't. Paper based binge reading would (unless you own an English 19th century manor with a library stretching for a complete wing or something like that) fill up your shelf space really quick Trust me, i tried. So i consider eBook readers to be an essential part of the trade. Since the first Kindle Paperwhite ended up with my SO, i used the release of the new edition to switch from my Kindle Touch to the new version. This photo is made under a very, very bright light (120W LED at my desk at home). So it constitutes the conditions where the old Kindle Touch is most competitive against the new Paperwhite. Even here the background is significantly brighter (setting is cranked to max). The readability is better though the contrast does not improve because the black becomes brighter as well. The lighting is definitely an improvement (as it was with the old Kindle Paperwhite). But not everyone has such a bright light available all the time. This photo is taken while the room is illuminated "only" by a 240W halogen light. The appearance is misleading, the old Kindle Touch is still very good readable. 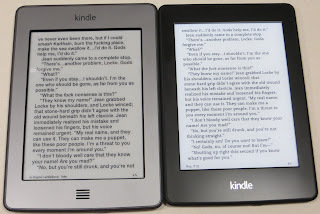 But the new Kindle Paperwhite outshines it by so much, the camera makes it look like a candle lit room. Usually i would (in such light) turn down the background a bit (but only a bit). The intensity can be adjusted quickly and in small steps. But even in complete darkness i would no go below the 8th of 24 levels. Below that, the text becomes unreadable in complete darkness and with any other light, the background is nor noticeable brighter. There is no sensor, all adjustment has do be done manually. Amazon eliminated the unequal distribution of light at the bottom of the screen completely. The resolution is upgraded to 212 PI (from 167 PPI for the Kindle Touch). This most noticeable when you use small fonts. Binge reader prefers small fonts since the page turn time is a significant delay and has not improved with the new version. The software continues to improve, the useful X-Ray feature has already been discussed in the past. I just mention it because i like it so much. It lost some weight compared to the old Paperwhite (7g), but this is not noticeable. Compared to the Kindle Touch it is still noticeable heavier (36g). The flash memory is still only 2GB. This is a disappointment since the cost for flash memory is negligible and i cannot put a full load-out into it. The background light has a significant impact on battery lifetime, no matter what the advertisement says. But as long as you have daily or bi-daily access to charging station, it doesn't matter. The faster CPU is only noticeable when you use the menu a lot. Page turn rate has not improved. Overall i am happy with those changes. As member of Amazon Prime i only paid 99,- Euro. This is above the U.S. price but contains a 19% sales tax (they cannot cheat on that as they do with eBooks since it's a physical good). If you still own a non-paperwhite Kindle, the only reasons not to upgrade are if the battery life is really critical (e.g. for your survival manuals during a trip in the Himalaya, in which case the 36g more would also matter) or you need a lot of storage space. Me, i am a satisfied customer. 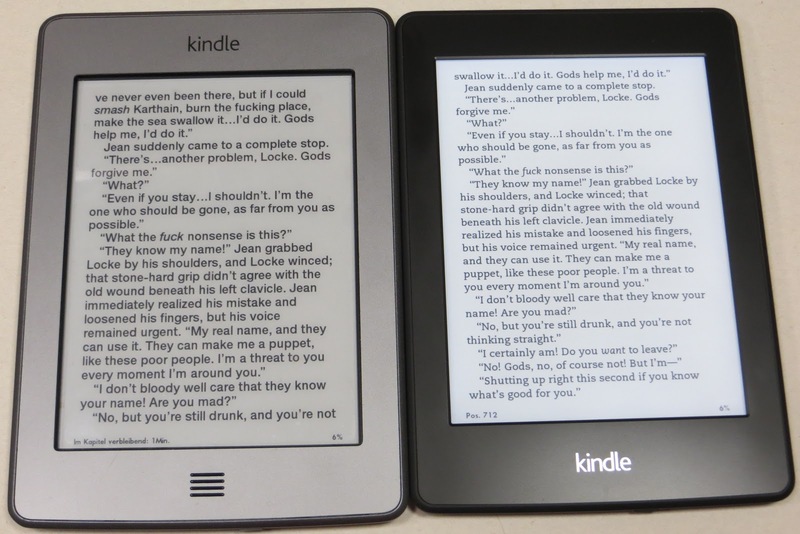 Attached are two images of the new Paperwhite Kindle (right) compared to the old Paperwhite Kindle (middle) and the Kindle Touch (left).